In January 1956, the Cochran Brothers went on the road to San Francisco and beyond to Oregon and Washington. KOVR-TV in Stockton, California had recently introduced a television show called “The California Hayride”. The visiting Cochrans were invited to join the resident cast or performers which prompted Hank and Eddie to make the Bay Area their stomping grounds during the early part of 1956 and to take up residence in Napa, California. Thanks to their TV appearances, The Cochrans enjoyed a busier work schedule. On March 10th, 1956, they appeared with Jerry Capehart on “Hollywood Jubilee”. On April 4th 1956, Capehart and the Cochrans went into Goldstar Studios to make demos for a batch of songs written for American Music. Of the half dozen or so songs recorded, “Pink Peg Slacks” stands out as an early Eddie Cochran tour-de-force. Modeled after Carl Perkins’ Blue Suede Shoes”, it was the first rockabilly song Eddie had recorded and it showed his peculiar mush-mouthed enunciation, mis-timed phrasing and popped consonants. Yet there were definite hints of things to come in the voice and guitar interplay and overall dynamic impulse of the performance. Elvis had shattered the cozy equilibrium of country music and Hank knew that he wasn’t cut out to be a Rock n’ Roller though he had shown he was prepared to make made a token effort. Eddie, however, embraced the idiom with a passion matched only by Capehart’s aggressive opportunism. Married and set in his ways, Hank was too much of his own man to fall under Capehart’s spell whereas Eddie, still only 17 was ready and poised for the call. Eddie began to pick up more session work as his reputation as a versatile guitarist grew among California’s closely-knit country music fraternity. Capehart was aware that most major labels were searching for another Elvis and took some dubs to Liberty Records. Formed by Sy Waronker and Al Bennett in 1955, Liberty records had made rapid strides when torch singer Julie London enjoyed a massive hit with “Cry Me A River”, but what they didn’t have was a Rock n’ Roll singer. Waronker was already half sold on the idea of Cochran before Capehart had finished his pitch, and when he actually met the boy, he was impressed by his good looks and obvious musicianship. Capehart had been doubly fortunate in his timing. He was vaguely acquainted with Boris Petroff. In July 1056, Cochran and Capehart were in the studio recording some background music for one of his low budget movies when Petroff asked Eddie if he would be prepared to appear in a film which a friend was directing. “I thought he was joking and asked him to call me” Cochran explained in an interview shortly before his death. The next day he called and asked Eddie to make a demo of a song called “Twenty Flight Rock”. Capehart and Cochran could scarcely believe their luck. Within the space of a few weeks, they were moving in film circles and had a bona fide record deal thrown in for good measure. Cochran went back into Goldstar Studio with Connie Smith on the bull fiddle and Capehart thumping a soup carton and emerged three hours later with “Twenty Flight Rock” and “Dark Lonely Street”. 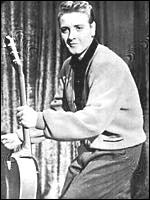 Propelled by the magnificent bass work of Connie Smith who had mastered the percussive “slapping” style pioneered by Bill Black on Elvis’ Sun recordings, “Twenty Flight Rock” was essentially a pastiche of early Elvis mannerisms and came to be regarded as a minor classic of the early Rock era, especially in Europe where it was released as a single and sold steadily over a long period. Smith developed a telepathic music rapport with Cochran and went on to play on virtually all of his recordings until late 1958. Cochran’s cameo part in “Do-Re-Mi” was filmed on August 14, 1956 at the Fox Studios. Jayne Mansfield and Edmund O’Brien are seen watching a television variety show on which an exciting new talent has just been announced. Cochran appears on the screen heavily made up to look like Elvis and sings “Twenty Flight Rock” to rapturous applause. “Do-Re-Mi” was still in the early stages of production and by the time it reached screen six months later, its’ title had changed to “The Girl Can’t Help It” after the song by Little Richard. Liberty was readying the film version of “Twenty Flight Rock” for release in December 1956, but before the record could be pressed a new priority had developed. Sy Waronker had been trying to purchase the rights to a record on the Colonial label owned by Jack Bentley. The song “Sittin’ in the Balcony” by Johnny Dee was attracting strong regional sales and was shaping up to be a smash. Bentley was being courted by several other labels and eventually placed his master with ABC Paramount. Not to be outdone, Waronker decided to record a cover version of the song for Liberty using Cochran as the proposed artist. Capehart and Cochran were summoned to Liberty’s offices where Waronker gave then Dee’s original and a day to make up their minds about covering it. Capehart remembers that on the ride home, he asked Eddie what he thought of the song. Eddie turned to him and said “Well dad, I think it’s a hit!” When they got back, they called liberty and told them to prepare a session. “Sittin’ in the Balcony” was recorded three days later and took several hours to perfect – a long time in the 50’s! “Sittin’ in the Balcony” established Cochran as one of the most exciting newcomers on the Rock n’ Roll scene and could not have come at a more fortuitous moment since its’ chart progress coincided with the release of both “The Girl Can’t Help It” and “Untamed Youth” on the movie circuits. Suddenly, it seemed that Eddie , unknown at the beginning of the year was everywhere to be seen. Cochran began the inevitable round of touring. In April, he spent a week at the Mastbaum Theater in Philadelphia on a package show with Al Hibbler, Nappy Brown, George Hamilton IV and Gene Vincent. It was there that he and Vincent met for the first time. In August, Capehart took Eddie on a promotional tour across the Mid-West and on through to the Eastern States. In the 50’s, it was an established practice for artists riding on a hit to make such trips to meet the DJ’s and thank them for their support. Behind every hit record lurks the demanding specter of the follow-up record and the attendant agonies of choice to be made. “Sittin’ in the Balcony” had strengthened Waronker’s hand in the selection of material and was reflected in Cochran’s next few singles. While filming “Untamed Youth”, Eddie befriended Johnny Russell and in the Spring of 1957 they collaborated in writing a handful of songs including Eddie’s follow-up single “One Kiss” and “Sweetie Pie”, a track which recorded at the same time but was shelved until 1960. A hollow facsimile of “Sittin in the Balcony”, “One Kiss” was one of the first pop singles to be packaged in a color picture sleeve – a touch of luxury only accorded to Elvis’ singles. Released in May 1957, it flopped disastrously, failing to even dent the “Top 100”.